Following the abrupt end of shopping channels Bid and Price Drop TV after owner sit-up Limited called in the administrators, how did the channels end up in this situation? And what happens next? Q: Why have bid and price drop TV gone off air? A: Owner sit-up Limited has been in financial trouble in recent months, and been under different ownership after being sold by German company Auerlius in December to Tnui Capital. Tnui Capital appointed KPMG to arrange a "Company Voluntary Agreement" or CVA. KPMG defines a CVA as follows: "Where a company is experiencing difficulties in paying its debts, the directors can propose a company voluntary arrangement (CVA) whereby the company enters into a legally binding agreement with its creditors, such as their suppliers or landlords. In a similar vein to an individual voluntary arrangement (IVA), which gives an individual an alternative to bankruptcy, a CVA enables a company and its creditors to come to a compromise agreement and avoid an administration or liquidation. A CVA can provide a company with some breathing space to allow it to reorganise or restructure its funding and/or its operations with as little disruption to the day to day trading as possible, with the control of the company usually staying within the existing management." Practically all of the company's creditors agreed to the CVA at a meeting on the 18th March. However sales of goods on the channel have - according to KPMG, who are now acting as administrators - "unexpectedly" fallen over the past month. The figures no longer added up for the company, the CVA fell apart, according to reports and the company ceased trading. In a brief statement on the price-drop.tv website, KPMG says it was appointed as administrators after the business had ceased trading. Q: What happens to viewers who have recently bought goods? What if they want to return goods? A: It's unlikely that viewers who bought goods just before the company ceased trading will get them, and the customer support teams who would deal with enquiries and refunds is no longer in place. Q: Is this why I lost these channels on Freeview a few weeks ago? A: In a move widely thought to be about reducing Freeview carriage costs, bid and price drop moved "multiplexes" on the week commencing 31st March, meaning they were being broadcast on new frequencies. Viewers needed to retune to keep watching. But Price Drop moved to a digital multiplex that has limited UK coverage and can only be received on newer TVs, set-top-boxes or PVRs that can decode "Freeview HD" signals, despite the channel only being in standard definition. In Wales, Bid TV disappeared from Freeview earlier this year, before returning on the 31st March for its final weeks on air. Q: Didn't they change the name and format of the channels in March? A: On-screen Bid TV changed to "shop at Bid" and turned into an "Ideal World" style of channel, with product presentations and fixed prices, and reduced telephone call charges. Importantly, on Electronic Programme Guides, the channel remained listed under its old name. It also continued to be licenced by Ofcom under its old name. Price Drop TV briefly split into two channels. Price Drop went daytime only in mid-March and became a stock clearance channel; evenings were handed over to "Best of Bid", offering viewers another chance to purchase goods in the same format as Shop at Bid. Then, earlier this month, Price Drop went full-time with a new format. 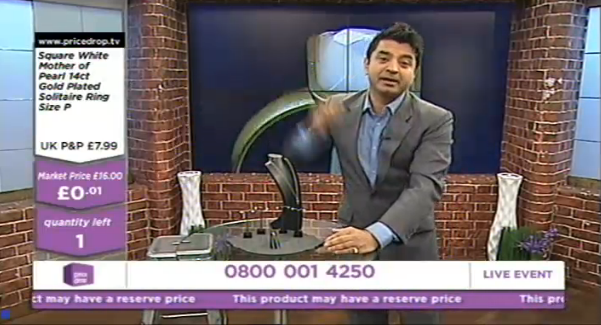 Viewers were invited to bid for items in a falling price auction. If the full quantity of goods had not been sold before the price dropped to a reserve price (which was unknown to the viewer), then all viewers who had placed a bid lost out. Coinciding with the change, the telephone number turned into a freephone 0800 number. In the days immediately before the channel fell off air, the format had been tweaked with for some auctions, so that all viewers would be "winners". Q: Weren't the products they sold rubbish? A: Toward the end, many of the products sold did indeed appear to resemble those found at bargain homeware stores and garden centres; hardly surprising given the reports that they had not been able to pay suppliers. This, and the fact that Price Drop would have lost a substantial number of viewers on Freeview following transmission changes at the end of March, probably helped cause what Administrators KPMG called an "unexpected fall in sales". Q: What happened to the staff, including presenters? A: All 200+ staff have been made redundant. Some presenters have found work on other channels. Mike Mason is heading to Ideal World and Lisa Brash joins 'The Outlet Channel'. (edit: and subsequently left). Andy Hodgson, who left bid tv long before it ceased broadcasting is now on Home and Garden Plus. Peter Simon is on Gems TV (Gemporia). You'll probably find other presenters pop up on other channels as time passes. Q: Any chance of the channels making a comeback? A: Although companies can rise from the ashes after being placed into administration, the events leading up to the closure of bid and price drop mean that it's very unlikely that the channels will return. Q: What happens with the Freeview slots? A: Both slots were held on Arqiva-owned multiplexes, and the plug was finally pulled on the 25th April after a week of the emergency "technical fault" slide which kicked in when the output from the studio was pulled. The bandwidth used to broadcast bid and price drop will be made available to other commercial channels in due course. Q: What happens with their Sky channel numbers? A: Canis Media has been appointed by KPMG to sell the EPG slots to another broadcaster. Unlike other digital TV EPG providers, channel number slots can be traded on Sky, as there is a limit to the number of standard definition channels on Sky. Q: What happens on other digital TV platforms? The situation on other digital TV platforms is less complex, with no channel number trading or capacity limitations. The channel numbers used by bid and price drop will likely be reused by other channels in the future. Freesat became the first digital TV provider to pull the channels from their channel list on Tuesday 22/04/2014. I used to buy quite a lot from Bid TV and Price Drop, lovely quality Tommy & Kate bags & high end watches, but the products started to become cheap and nasty, and I have not bought anything for over 3 years. The biggest downside has always been the telephone call charge and the p&p at £7.99. I do feel for the presenters though as most of them had been there for a long time, and I wish them well. Shame really bought loads of good stuff from them over the years but did not like the new format at all. The presenters were great and such fun! Hope they do well elsewhere. The bags, bedding and big brand fragrances were the best bargains on bid and price drop. Will miss the banter tho and wish all the presenters and staff good luck for the future. Thanks for the memories! I never bought anything from these channels, but I left the TV on one or other of them when I wasn't at home, and they were cheerful talking and visual company for the cats! Sorry for the staff, but I expect they mostly have TV contacts who will be able to get them other jobs. What happens about all the credit/debit details they hold on file are they still safe, will they be deleted? The administrators (KPMG) will still need to adhere to data protection rules. After Easter, KPMG are expected to publish more information for concerned customers. I bought a few good and not so good items . But what I did notice was that by the time the phone call and p&p was added sometimes it was cheaper to buy in the shops . LAST YEAR I BOUGHT A 9INCH YARVIK TABLET.FROM THEM £199.99 FREE p+p.. NOW THE TABLET WILL NOT TURN ON..I TOLD .BID.TV .THEY TOLD ME TO RETURN IT THE TABLET BACK TO THEM..I ASK FOR A COPY INVOICE TWICE I NEVER RECEIVED EITHER OF THEM..NOW I DON'T KNOW WHAT TO DO SINCE THEY HAVE CEASED BROADCASTING.I'M REALLY UPSET BECAUSE £199.99 IS ALOT OF MONEY TO LOSE ..
i will miss price drop and bid what happens to all the accounts people made for payments? They used to sell good quality stuff at first but then they started to sell utter crap. Bad management and bad decisions have lead to administration. I do feel sorry for the presenters such as James Russell, Mike Mason and Peter Simon as well as those poor sods with mortgages and children. Good luck for the future. It's actually the old bid tv bandwidth that's being used for CBS Reality. Bid was in turn using the old price drop bandwidth. When the plug was pulled and all staff were made redundant, the "technical fault" caption kicked in - the default when the feed from the studio is lost. As no-one is left at the studios, the caption could well stay until someone pulls the plug further up the broadcast chain. Oh well now I know why the watch I ordered hasn't turned up. Would've been nice for channel to inform me and no doubt many others who aee still awaiting items. Thankfully under £20 down the tube feel sorry for those who have obviously lost more. I for one won't trust tv shopping channels again. Administrators from KPMG LLP were appointed on 17 April 2014. Sit-up Limited had ceased trading prior to the appointment. Please check back later, we apologise for any inconvenience. you may have noticed that the Q&A above has been amended with that new information within the last hour. I agree it's quite odd, especially after the initial news release on Thursday that stated that the business was in administration and the channels will cease later today, suggesting it was the other way round! We await more information with great interest. No problem. Some users may be following the comments using the "email follow-up comments" function and may not be aware of the update on the page, so the first time those users will have seen the email address would have been in your comment. i have shopped with all channels for 10 years plus.i needed to return an item and asked for a collection as i had a severe mobility problem. i was told by ur overseas rep that i wud have to get a letter from my G P to confirm this. i have not bought anything since july last year. i used to spend 200 pounds a month at least. that was my last purchase. Bid and price drop have now been switched off from Freeview. Bid Tv and Price Drop are no longer available on Sky either. james russell brilliant talent why he is not hosting barrymore type shows one beggars belief. if anyone talent scouting is reading this, he is hot property get him doing take me out or something like that. Name That Tune 2014 ? The New Generation Game 2014 ? Mr & Mrs TV Show 2014 ? I mean come on are you all half asleep producers please is there anyone out there. Talent must be recognised and appreciated. Will the number on freeview 807 still stay up, I have been trying every evening for a few days and lately it has just gone black??? so sorry to hear about bid and price drop. because of the owners charging such ridiculous prices for postage and to my mind, shoddy goods, a lot of people have lost their jobs. it wasn't the goods that made the program, it was the presenters, especially peter. I just hope another company will snap them up quickly and learn lesson from other programmes like gemporia. very good luck to all concerned. If it doesn't bother you, defer retuning until 3/09/2014, when there'll be some changes to Freeview channel numbers. Thank you for your comments on this topic. This article is now closed for further comments.